If you are looking to enhance the look and feel of your religious space, consider the addition of stunning stained glass. Stained glass art will help lend beauty and warmth while also aiding in worship and fellowship. Stained Glass Inc. offers a wide selection of religious images that will help evoke reflection, meditation and prayer throughout your congregation. These panels of truth and light are a beautiful way to display your faith and inspire those around you. Moreover, these works of art will capture and refract light, helping to set a mood of peace and tranquility. You can choose to utilize any of the images Stained Glass Inc. offers, or you can custom design a piece that will be unique to your space. 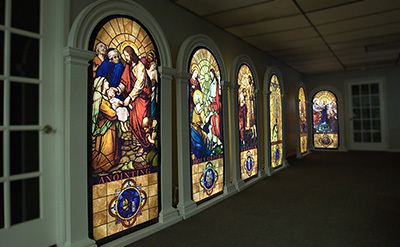 Stained glass can be incorporated in a number of ways in your house of worship. You can choose to keep things simple with traditional stained glass window inserts or you can get creative by using stained glass door inserts, ecclesiastical signage or even a majestic stained glass dome. If you would like to experience stained glass without relying on natural sunlight, consider Stained Glass Inc.'s innovative backlit designs. These "windowless windows" will provide you with beautiful, illuminated stained glass anytime you desire. Stained Glass Inc. provides beautiful stained glass art to many different churches and houses of worship. 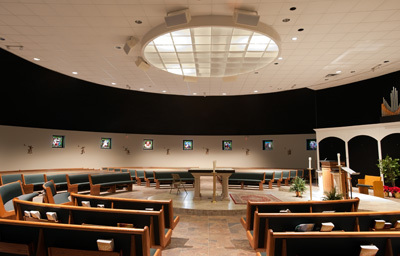 If you would like to get started creating a design for your religious space, call us today. Our talented team of experts will work with you to create the perfect stained glass masterpiece.